Lt. Robert Turchette, B17 bomber crew honored in Sheridan, Ark. A ceremony held March 12, 2013, marked the 70th anniversary of the crash a U.S. B-17 Flying Fortress in rural area near Sheridan, Ark., honoring the crew killed in the crash which included a young flyer from Nutley, N.J.
At the memorial ceremony, enlisted servicemen held photos of the crewmen. The airman to left of American flag is holding a photo of co-pilot Lt. Robert Turchette of Nutley, N.J.
Co-Pilot: 2nd Lt. Robert V. Turchette, 22, Nutley, N.J.
Navigator: 2nd Lt. Leo E. Dolan, 24, St. Louis. 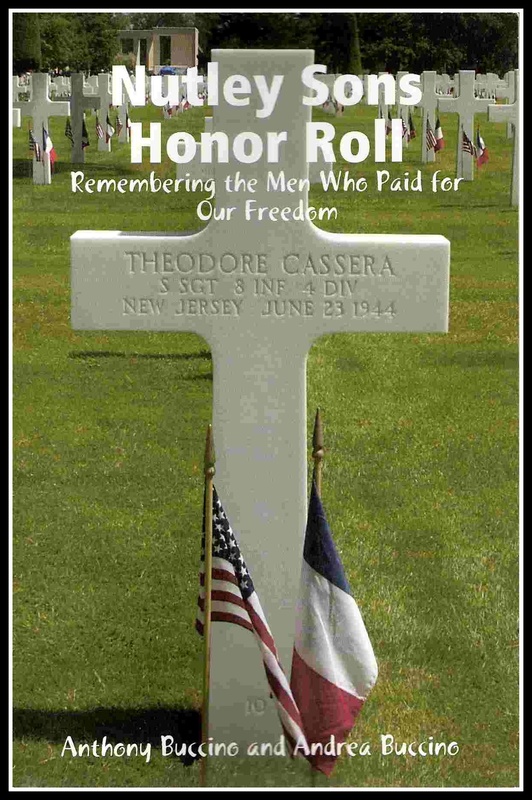 Bombardier: 2nd Lt Phillip E. Niewolak, 24, Dunkirk, N.Y. Engineer: T/Sgt. Dewitt H. Tyler, 25, Porterville, Calif.
Radio Operator: T/Sgt. Peter K. Ivanovich, 25, Bisbee, Ariz.
Waist Gunner: S/Sgt. Arthur N. Potter, 26, Springfield, Vt.
Ball Turrett Gunner: S/Sgt. David G. Secorski, 22, Detroit, Mich.
Tail Gunner: S/Sgt. Kenneth D. Cain, 22, Hobbs, N.M. The American Legion Post 30 and the Disabled American Veterans Chapter 53 are constructing the one-acre memorial park in Grant County at the crash site to honor the nine crewmen who struggled with the crippled airplane to avoid landing in a populated area. Nelson Mears, Randy and Debbie Bush have researched the biographies of the crew. Veterans and area residents believe that pilot 2nd Lt. George Davis should not have been held responsible for the loss of his B-17F Flying Fortress and crew. Rather, he should have been recognized for his valiant efforts in keeping his Flying Fortress airborne while over the populated area. The actions of Davis and his crew in finding a non-residential area on which to crash land possibly saved the lives of area residents. While the construction and ongoing upkeep of the Sheridan B-17 Memorial Park is their primary mission, the people creating the memorial see their secondary mission to clear the record of pilot George Davis. Local veterans and area residents believe that Lt. Davis should not have been held responsible for the loss of his B-17F Flying Fortress and its crew. Rather, they say he should have been recognized for his valiant efforts in keeping his Flying Fortress airborne while over the populated area of Sheridan. The actions of Lt. Davis and his crew in finding a non-residential area on which to crash land possibly saved the lives of area residents. 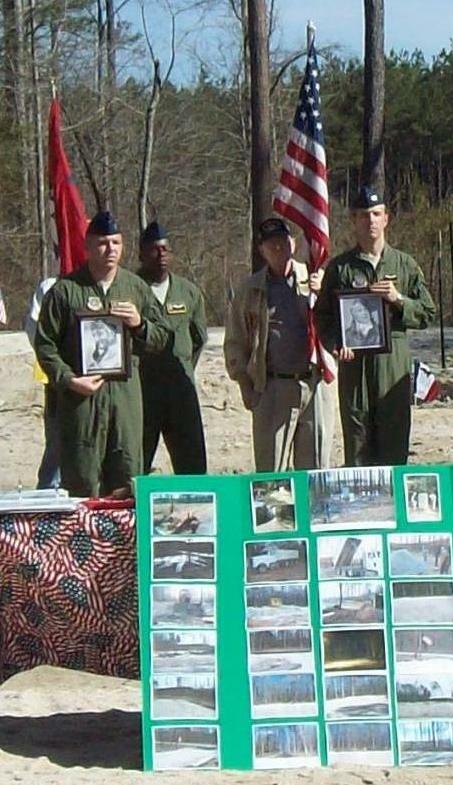 A ceremony held March 12 marked the 70th anniversary of the crash a U.S. B-17 Flying Fortress in rural area near Sheridan, Ark. Mears said the group brought in more than 3,750 tons of sand to the cleared site. The most predominate feature of the park will be a memorial wall 33 feet wide, 8.5 feet tall. It will have a 29 feet wide, 4.5 feet tall portion inset of black granite containing the names and information about the nine airmen. The memorial wall will be illuminated from dusk to dawn. A life-size concrete footprint of the B-17F Flying Fortress will be placed between the original monument and the Memorial Wall. The surface of the B-17F concrete footprint will be painted and when viewed, it will appear that you are looking down at an actual Flying Fortress. The Stepping Stone project will include an area dedicated to 62 fallen Grant County residents that were killed-in-action from WWI through the Vietnam War. Dedication of the Sheridan B-17 Memorial Park was held Nov. 12.